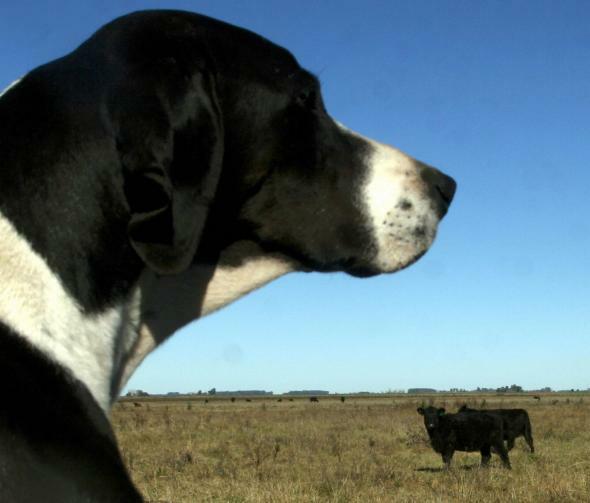 Rover the cattle-herding robot comes for dogs' jobs. Who will retrain this dog for a new high-tech position? Those dastardly robots! They aren’t content to replace bartenders, journalists, and lawyers—now they’re coming after jobs performed by dogs, humans’ other favorite mammal. Researchers in Australia have created a robot that can herd cattle. Its name, of course, is Rover. While a human being has to guide Rover for now, there are plans to automate it, according to BBC News. For city slickers like me who enjoy watching a dog earn his kibble the old-fashioned way, this is a tragedy of automation. But according to the BBC, some Australian farmers with no sense of tradition have taken to rounding up their beasts with four-wheelers, which can cause injuries to human and animal alike. Rover offers a safe alternative if you’re already planning to the Australian cattle dog out to pasture. And as you can see in the video below, the bot’s performance is pretty impressive.